Hemangioma is the most common benign liver tumor. It is composed of multiple vascular channels lined by a single layer of endothelial cells. The size may vary from a few millimeters to more than 10 cm. If they are larger than 10 cm in diameter, hemangiomas are designated giant hemangiomas. In over 50% of cases, more than one hemangiomas is present. US of a typical hemangioma shows a sharply circumscribed, well-defined hyperechoic lesion with distal acoustic enhancement (Fig. 1). However, about 20% of hemangiomas lack this typical appearance. On CT, hemangiomas are sharply defined, hypodense masses compared to the adjacent hepatic parenchyma on unenhanced images. They have a distinctive enhancement pattern characterized by sequential contrast opacification beginning at the periphery as one or more nodular or globular areas of enhancement, and proceeding toward the center. The key factor is that all areas of lesion enhancement should appear with the same enhancement as blood pool elsewhere (Fig. 2). MRI is useful in differentiating heman-giomas from malignant hepatic neoplasms, based on very long T2 relaxation of the hemangioma compared with other hepatic masses. Other characteristic MRI features include a sharp margin and internal homogeneity. Similar to CT, key to diagnosis is typically early enhancing peripheral nodular enhancement on dynamic T1 images, with progressive fill-in on delayed images on dynamic gadolinium-enhanced MRI. However, in some cases, hemangiomas may be atypical. 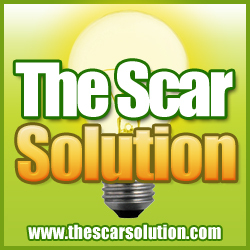 With both CT and MRI it is important to remember that central fibrous scarring prevents some large lesions from completely enhancing in this dynamic process. Furthermore, on MR images some giant heman-giomas of the liver may show a rim of low signal corresponding to a rim of high density on CT related to hemo-siderin deposits. Other atypical hemangiomas may have high blood flow due to arteriovenous shunting [6-9]. Fig. 1. 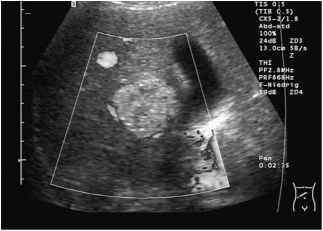 Hemangioma, typical hyperechoic appearance at color Doppler sonography. Note central hypoechoic structures due to scar formation tral scar may be detected as a hyperechoic area, but often cannot be differentiated from other areas of hyperechoic or isoechoic appearance. The use of color flow Doppler US demonstrates blood vessels within the scar. Due to the prominent arterial vascular supply, FNH undergoes marked homogenous enhancement during the arterial phase of contrast-enhanced CT , except for the scar, which often enhances on delayed scans. On unenhanced MR images, FNH often has signal intensity characteristics close to hepatic parenchyma, but usually slightly different on either T1 or T2 images. The central scar is most often hypointense on T1-weighted images and hyperin-tense on T2-weighted images. Gadolinium-enhanced MRI reveals enhancement similar to that observed with contrast-enhanced CT. One key feature is that, other than the scar, these lesions tend to be very homogeneous in appearance. Additionally, FNH shows enhancement on delayed images after administration of hepatobiliary contrast agents such as Gd-EOB-DTPA or mangafodipir trisodium (Primovist®, Teslascan®) and signal loss after administration of RES agents such as superparamagnetic iron oxide (SPIO) [4, 11]. This uptake parallels uptake of Tc-99m sulfur-colloid in scintigraphy and is a useful tool for characterization. Hepatocellular Adenoma (HA) is an uncommon benign, but pre-malignant neoplasm with non-specific US findings. Pathologically, most HAs are large (usually > 10 cm), solitary lesions with a smooth, thin tumor capsule, often rich in fat and void of portal tracts but containing RES cells. Intratumoral hemorrhage can produce areas of infarction and fibrosis. CT and MRI appearances of HA are also non-specific. On unenhanced CT images, the lesion may be hypo-dense due to the presence of fat, old necrosis or hemorrhage, or it may be hyperdense owing to recent hemorrhage or large amounts of glycogen. Substantial enhancement during the arterial and early portal venous phases of contrast enhancement may be noted. On MRI, most lesions are heterogeneous in signal intensity, with a majority being hyperintense on T1-weighted images and isointense or hyperintense on T2-weighted images . 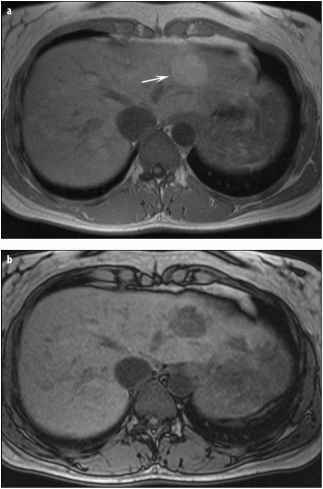 On out-of-phase or fat-suppressed MR images, hepatic adenomas may appear hypointense compared to the liver (Fig. 3). On dynamic contrast-enhanced gradient echo imaging, adenomas usually appear hyperintense compared to hepatic parenchyma. Like focal nodular hyper-plasia, HAs may show delayed enhancement with hepa-tobiliary contrast agents but opposite to FNH wash-out effects on very late images taken 1-3 hours after the injection of, for example, Gadobenate Dimeglumine (MultiHance) . After administration of SPIO, HA may show uptake within the lesion and therefore signal loss on T2-weighted MR images . value (< 20 Hounsfield Units [HU]), that shows no contrast enhancement after iv contrast material administration. Small lesions may appear to have higher density because of partial volume averaging. An US evaluation is usually helpful in demonstrating the cystic character of the mass. On MRI, they are well-defined, homogeneous lesions that are hypointense on T1-weighted images and on US they are anechoic and markedly hyperintense on heavily T2-weighted images. Abscess, hydatid cyst, intra-hepatic biloma, and cystic neoplasms may be distinguished from simple cysts by virtue of features such as a thick, irregular wall, mural nodules, internal septations, or density greater than 20 HU .